We are very excited to work with public laboratory to come to understand the wastes laid down on Kidder Point over the past century and stimulate agency action protecting people and wild nature. Please help us work with you that they we can get GAC Chemical to be a good corporate citizen and "stop beating the bay!" BACKGROUND (Starting with most recent) Our preliminary test in January of samples from the site at the southwestern end of Stockton Harbor has now triggered a Coast Guard-led review pursuant to the superfund law](http://www.epa.gov/superfund/policy/cercla.htm) federal law barring the release of significant amounts of sulfuric acid into the environment. click here to take several tours of this cove (photogallery). 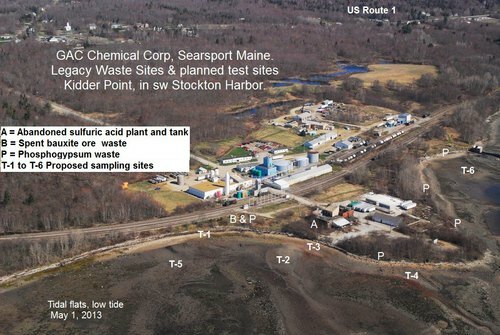 Because we are concerned that tourists and local beachcombers visiting the cove in Searsport, Maine may be unwittingly getting exposed to unsafe levels of sulfuric acid and heavy metals, we have embarked on gathering the evidence sufficient to trigger federal action. We have done so regarding waste sulfuric acid, thanks to assistance from Dr Mark Green at St Joseph's College in Standish Maine A leading Maine ocean acidification researcher, Dr. Green examined site sampless gathered under his guidance in January, and found pH levels below 2 on the beach closest to the eroding shore, with pH slowly rising the farther away from the eroding bluff but remaining below 7 at the low tide line. Dr Green observed that such acidity liberates heavy metals and waste chemicals from silt, clay and other particles they may be bound to, making them more easily bioabsorbed by beachcombers, worm diggers and wildlife visiting the cove. For that reason we want to gather information on whether heavy metal wastes are eroding onto the beach and flat - ourselves - competently enough that the results are an unequivocal smoking gun (or not) that can be helpful as scoping guidance to the federal agencies as they move forward in their process. 2. Refining and synthesis of mined data from the past century of government and mercantile reports of site use of that site and environs, and local and regional news reports relating to that Kidder Point location (formerly "Kidder's Point") since 1900, when the first trial fertilizer plant was built there and began servicing Maine agriculture. But detecting the presence or absence of heavy metals, hydrocarbons and pcbs in these salty muds and sand is our most urgent need-to-know and need-to-know-how priority. "Note in this photo comparison the expansion of the peninsula between 1940 and 2011, with the spent phosophogypsum and bauxite wastes. "Here is a 1984 site assessment that includes conductivity surveys of the beach and intertidal This should serve as a useful historic background standard. "I also believe that the complicated geography of the most afflicted cove has an immense impact on where the wastes are going once they're off the eroding bank. This includes effects of the mitigation sandbar closing off much of it, the causeway illegally built to Sears Island in the 1980s (supposed to be a bridge! ); the remains of stone walls from now vanished structures; all these concentrate the runoff and orchannel different wastes from different parts of the point into at least three separate outlets into greater Stockton Harbor." I would go after a test from the dept. of ag in maine. the university of maine has a great how-to. Lead is a standard on the test but I'll bet they do the other heavy metals.